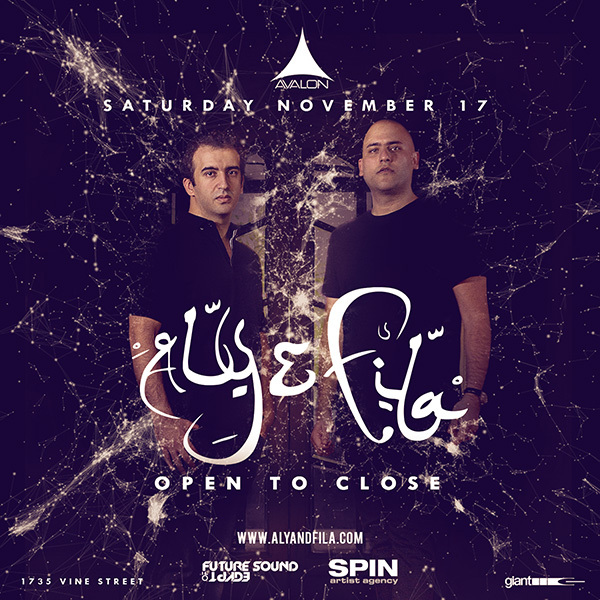 AVALON is ecstatic to welcome Aly & Fila’s headline debut for an open to close set on Saturday November 17th. Hailing from Cairo, Egypt, the Trance duo is fresh off a massive performance at Tomorrowland in Belgium and have a plethora of other headliners under their belt. Hometown heroes and national phenoms alike, Aly & Fila are one of the only music acts in the world, alongside Sting and Kylie Minogue, who have performed at one of the Great Wonders of the World - sickThe Great Pyramids of Egypt. Known for their massive singles ‘We Control The Sunlight’ and having also graced stages such as ULTRA Singapore, The Hollywood Paladium, been voted #1 DJ in the Middle Eastern Music Awards, the duo is revered as a part of one of the highest echelons of international trance. The Start of 2017 saw Aly & Fila Voted #1 DJ & #1 Producer on the 2016 Trance Podium Awards With FSOE 500 under their belt as well as a new artist album, pointing the duo’s sights for greatness. Don’t miss Aly & Fila’s debut open to close at AVALON Hollywood.